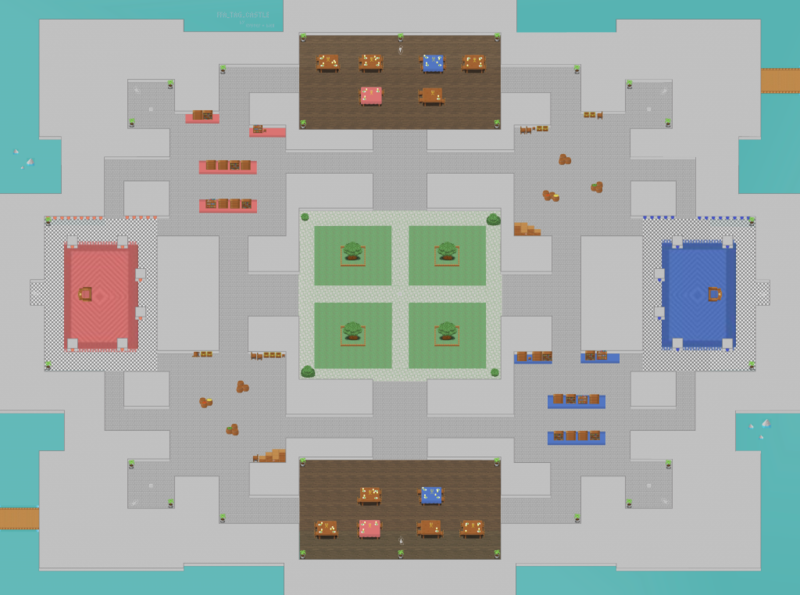 I created a new map to use my new tag game type. Ths one is based on Oyster's castle map. I made it so you can fly under the tables and behind some crates. I also updated the tag game type so that another player is randomly choosen to be tagged as it. You now get 1 non-it kill per minute, if you go past 15 kills on Map QA (where ffa is set to 15 minutes), you will be dropped by the server. It isn't a kick, so you can connect right back in (assuming people aren't on auto-join). It is almost identical to Oyster's original map. And tag is a fun, easy game mode! Does the "non-it kill limit" apply to the person who is 'it'? For example, if I'm 'it', can I kill the people trying to kill me without having to worry about exceeding your kill limit? Also, regarding the map itself - with gravity turned off, it is very easy to go under one of the tables and just sit there, without anyone knowing you could be there. Parafalse doesn't reveal what's under the tables either. You could essentially do this until the server starts giving away your location, and then just do it again the next time you are 'it'. Is this something you've considered? Or was that your intention - to create a sort of hiding spot? Cool map though, I look forward to playing it with others. Last edited by Kafka; 02-18-2017 at 04:06 PM. I updated the tag game type (thanks to LewisH's server patches) so now all players in the pack are blue, and the one who is tagged it is red. This should help distinguish them. I also added a few more hiding spots under the bushes in the center. Also, now if a player is choosen to be it, but doesn't spawn, then a different player is choosen after about 10 seconds. When hiding, remember that your name is sometimes visible above your plane, you should leave room for that. Gravity is turned off so that players can accelerate at full speed upwards, and so that you can more easilly hover in a hiding spot. Per Kaf's question, the player who is it may kill any other player without consequence. In fact, sometimes the server will spit out the phrase "The best defense is a good offense" when that happens. I set spawnHealth to 75 b/c it was proving too hard kill the tagged player on such a large map. Good strategies for this map are to emp the hiding spots, looking to see if the player is hiding there, and to have the pack coordinate a little and enter the same area from multiple entries to corner the tagged player. Also, the servers have a command `/prey <nickname>` which can be used to set who is it. So, if everyone agrees that a certain player should be it so they can use the map as a most dangerous game type of map, they can `/vote prey <nickname>` that player to be it. Last edited by biell; 02-22-2017 at 07:03 AM.